Meetings start at 7:00 p.m. and are held at the Syphax Education Center unless otherwise noted below. Work sessions are open to the public but no comments are accepted. May 7 – Public Hearing on School Board’s Proposed Budget, 6:00 p.m. The Budget Office is currently working on the Adoption Phase of the FY 2020 Budget Development Process. 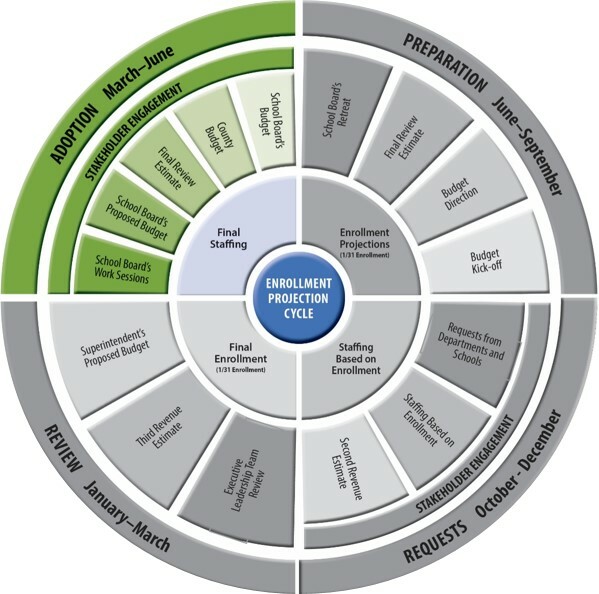 Click the image for an enlarged view of the budget development cycle. Work sessions start at 7:00 p.m. and are held at the Syphax Education Center unless otherwise noted below. Work sessions are open to the public but no comments are accepted. Watch School Board Work Sessions live and view past work sessions.